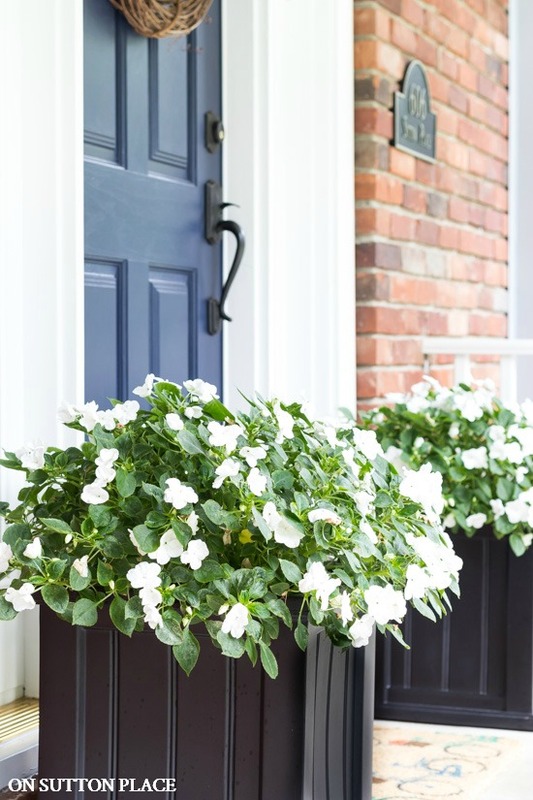 In this post: Easy, summer flower planter ideas with impatiens that pack a big punch and add charming curb appeal to your home. Low maintenance and continuous blooms. In the early spring, I picked up two amazing lobelia plants at a local market for the black flower planters on our front porch. They did well for a while, but once we had some really hot temps, the lobelia plants stopped blooming. I decided to move them to the back and plant something fresh for summer. I had every intention of buying two ferns when I went to the market, but left with two large white impatiens instead. When I got home, I discovered that the impatiens were sort of lop-sided. They were full on one side but sparse on the other. I completely regretted not opting for the ferns! Anyway, I was stuck with these two white impatiens and had to make the most of the situation. I freshened the potting soil in the flower planters, added the impatiens, gave them a shot of Jack’s Fertilizer, and hoped for the best. Nothing much happened for a few weeks, but then the impatiens started to fill in and bloom. The blooms continued even though I occasionally forgot to water them. They grew, got thicker, and are now almost ready to fall over the edges of the flower planter. My favorite thing about these white impatiens is the way they show up from the street. They have upped our curb appeal, at least for a while, and that’s always a good thing! This idea is a budget-friendly, low maintenance choice for a partially shaded area. It packs a tremendous punch for very little money and hardly any effort! It’s always really pretty to add some sort of vine to a flower planter. Good old hardy ivy, asparagus fern, vinca, or sweet potato vine are good choices. 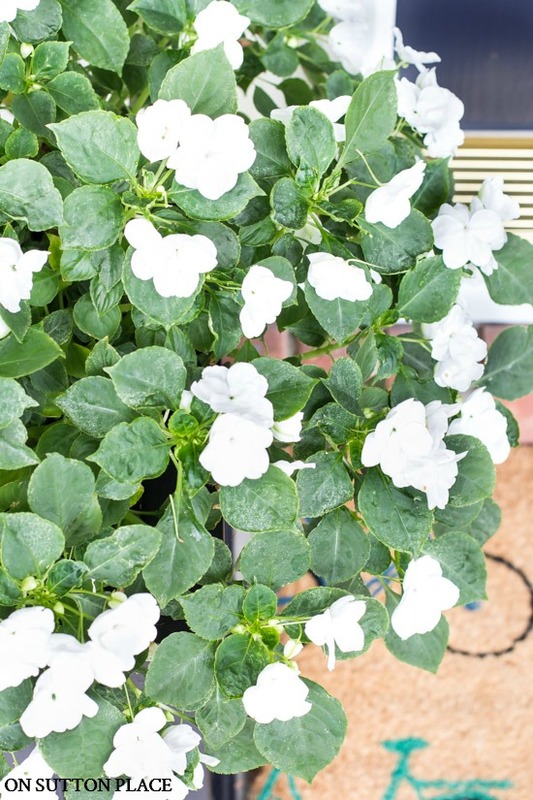 Add these trailing plants to the corners or edges of a planter. I tend to stick with one bloom color for my pots, but to add some variety, it’s fun to choose plants with colorful blooms. Impatiens comes in red, coral, and pink. Adding any of those summery colors to white would be beautiful. Adding something tall to the middle of a planter not only adds height, but it adds interest as well. Any kind of fountain grass, spike, or coleus will do the trick. Make sure to pay attention to watering and light requirements when planning your flower planters. I love flowers and when I was younger, I planted them everywhere. Now, I am content with my small perennial garden and a few planters filled with annuals. Even though my planting process has been greatly simplified, I still have small spaces around my home that are filled with blooms. Remember…it doesn’t have to be big to be beautiful. These are so pretty and classic! I love them, Ann! Those are beautiful, Ann! Thanks for sharing your tips! I love them! I look forward every Saturday to all of your DIY’s, recipes, and seasonal suggestions! I am going to make the beautiful paper flowers….they are beautiful! They are beautiful Ann. I used some pink inpatients this summer. Seem to work best in containers, however. 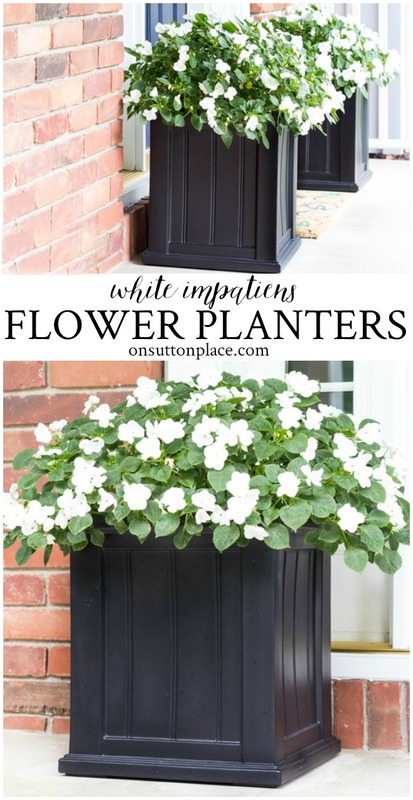 The white impatiens are lovely, and really show up nicely. And white looks great with everything! 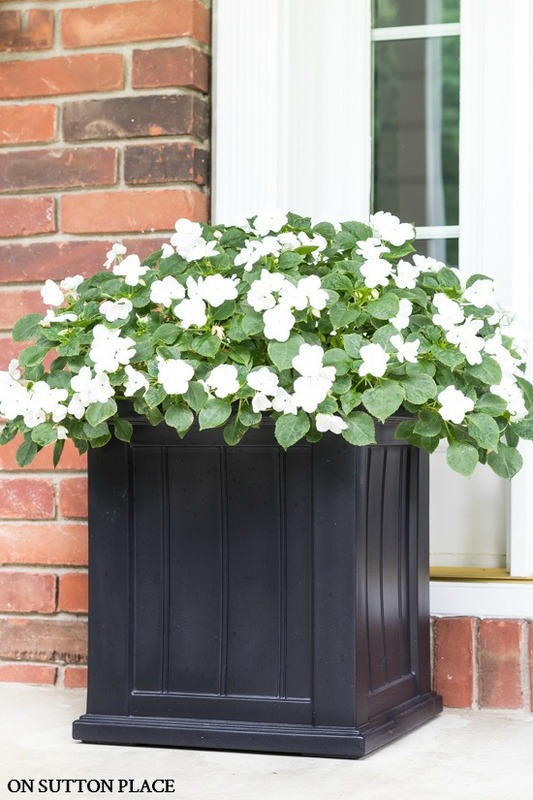 I have red impatiens with lime green sweet potato vine in my black planters, and pots of white impatiens next to them. A very pretty combination! Summer goes along so quickly, doesn’t it? But I love fall too. Looking forward to seeing your ideas for fall decorating, You always do something a little bit different, which I love. In a previous news letter, I found a recipe for Lavender Lemon bread. I noted that although vanilla is listed in the ingredients, there is no direction in the method to add the vanilla. Hi Beverly…I fixed the recipe. Thank you for letting me know! May I ask why you prefer Jack’s fertilizer over Miracle-Gro? Jack’s was recommended by a gardening group I am in…so last summer I tried it. I have pink Endless Summer hydrangeas that normally get just a few blooms, and this summer they were almost full. I also used it on my limelight hydrangeas in the early spring, and they are healthier as well. I had trouble with the blooms falling over because the stems were too weak, but this year the stems are much stronger. It may not work for everyone in every condition, but it worked for me! Thank you, I will try it next year! Happy August dear lady. After this hot at at times very dry July I am looking for a little relief this month. Gardening has been a challenge this summer especially in containers. Definitely have found impatients, begonias and Kimberly ferns to be tough plants. 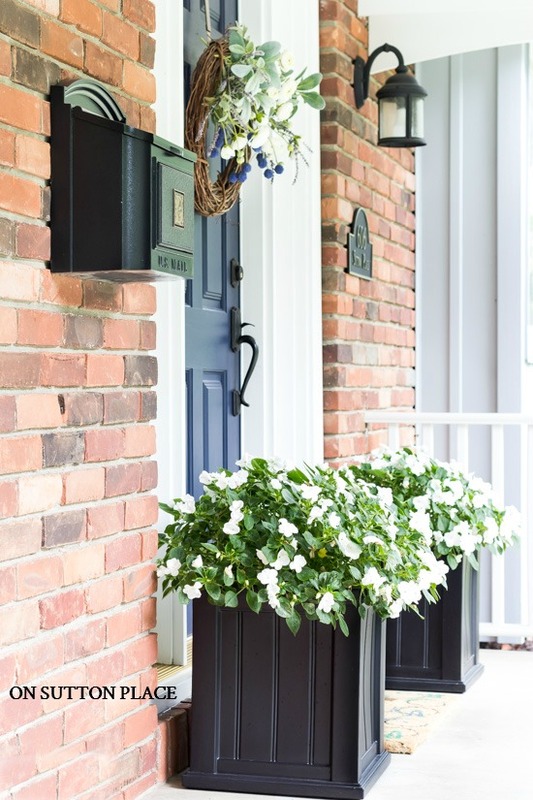 Throw in some chartruce sweet potato vine and my large front porch planters held up well. Still I find myself looking forward to pumpkins,acorns,bittersweet and fall foliage! Hi Ann, I had the same thing happen last year with my Lobelia. Moved them to the back as well, but couldn’t get them to come back. Read up on them on the Internet and this seems to be a common problem. Too bad, because they really are beautiful. I have neon coral impatiens in the railing pots on my front porch. Our house is brown and tan, and everyone comments about how they show up from the street against our house color. They’re really easy to care for, as long as they get the right amount of water. By the way, even though we are life long Pittsburghers, our daughter is a graduate of OSU. GO BUCKS! Did you know Ben Roethlisberger is from my hometown? He graduated high school one year ahead of my daughter. Go Steelers! I love the planters and the impatients! They look fabulous! inpatients have always been my go to for the front, north side of our house… Each season a different color.. along with my calla lilies, they really make a beautiful combo and are so hardy.. 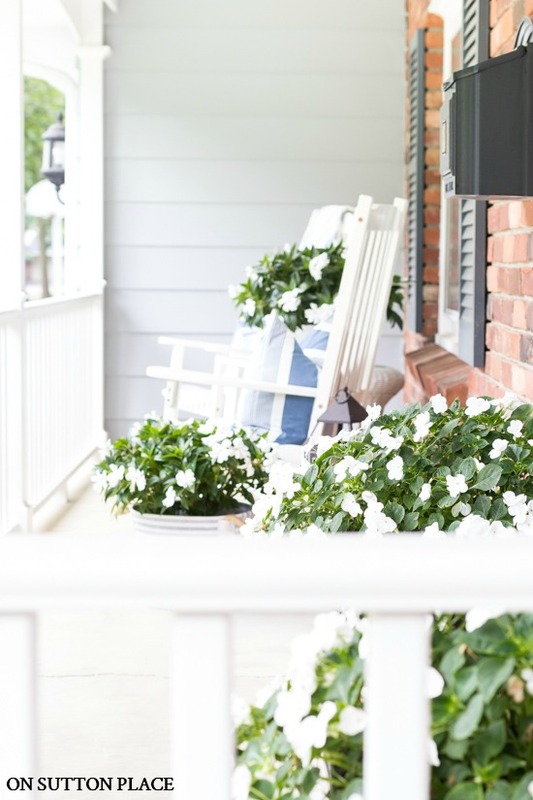 Your porch looks lovely! I wish that I had a porch, but I must settle for decorating my steps instead. I am in NO hurry for anything autumn…because then comes early dark, cold, gray YUCK. Sunflowers, dahlias, etc are fine with me for weeks to come! Ann I have to say you are right about the impatiens. Even though they are annuals they are beautiful and put on a show for the entire summer and well into the fall. I bought some fuschia colored impatiens on markdown. They were in need of some tender loving care. I planted them into two planters that sit on the steps to my kitchen porch. They survived the transplant and then exploded into a riot of color. The planters are full and draping over their sides. Just beautiful. Next year I am planting just impatiens. Weeks and weeks of color with little to no trouble. The white ones really do look lovely. Love impatiens for the shade, the planter link said they were $72 each. Too much for my budget but they look nice. Ann, I think we forget that white flowers can be absolutely stunning in our gardens. With a few cooler days (80-90 instead of 100) our plants don’t look as sad. I love when they perk back up. The black planters are always classic. Always beautiful… and I can’t wait to see what you come up with for Fall! Especially if there are new Printables! I painted my front door SW Naval bc I’ve loved your front door ever since I saw it. Thank you for telling me about your door! I live in Texas & it’s been a long, hot summer! Fall is still very far away, but I’ve been thinking about Fall & dreaming of cooler temperatures for a couple weeks now. 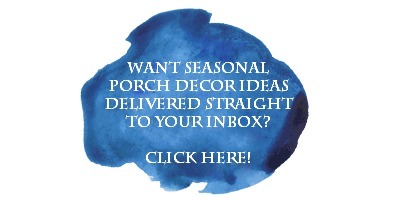 I’m looking forward to seeing what you’re planning for your Fall decor. I decided to do all white flowers this year too. It is amazing how you do see them from far away. I plant white impatients every spring. I always try to get the “super elfin” variety as they are taller than the bedding ones. White ones really show up nicely from a distance. I have mine in an old milk bottle crate. Looks great!! Ann, these are absolutely beautiful! Simple, unfussy, but so classy. I am a covert to Impatiens having bought six little plants as a last resort weeks ago to fill window troughs. But amazed at their prolific flowering and so inexpensive and easy to care for.